We have helped quite many companies throughout the years to upgrade their businesses by replacing their legacy reservation systems with our modern reservations and operations management system. But there are four that we are especially proud of: Transdev Eurolines, Lux Express, Karat-S, and Tpilet. They had considerable challenges that were mainly caused by a legacy reservation system. For example, Transdev Eurolines was struggling with a legacy reservation system that crippled their competitiveness and operational efficiency. Using a legacy system meant that they weren't able to distribute seat reservations in real time and dynamic pricing wasn't an option. Additionally, they were struggling with integration of third-party resellers. As you can see, their legacy system was giving them quite a headache. 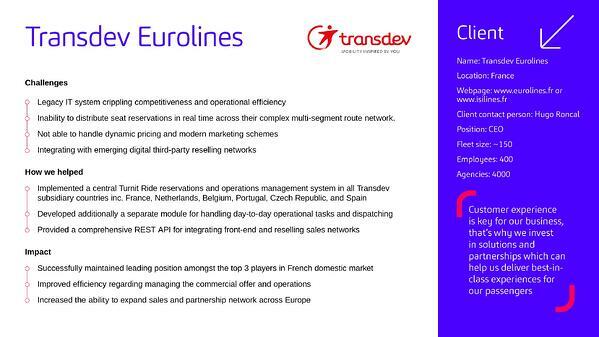 To see how we helped them overcome those challenges be sure to download our Transdev Eurolines case study by clicking on the picture below. Wish to see how we helped the other clients?